gg1998 had the most liked content! A little thing for your further research, I used Google translate and Wakasa means Youth. So in other words Wakasa and Asaka are interchangeable. Lance can also signify a straight forward person lacking tact and deceit. It can be if Gosho remains rooted to this policy, but there was one Kid-case file(in DC) where Makoto did the same stuff to grab kid who disguised as Sonoko. So it can be a determining factor and to me also the index finger looks bit shorter than middle finger, though. Not from the picture alone, man. To be honest Law enforcement agencies seriously lack any photographs of Asaka, only that photo was out in the public domain. That's why my assertion, though photophobic might not be the correct word, cautious about disclosing his/her identity. I screwed up, sorry for that. Then again, if some people had pictures of Asaka, then they would have uploaded or emailed the stuff to the website. The Law enforcement authorities would have had them and by now would have ordered a look-out notice for Asaka. Nothing of that sorts is happening, hence my bold claim. If without any ambiguity one says Asaka was holding a mirror, then it means that person was able to identify Asaka without a doubt. But the uploader of Kohji case uploads that not a single soul was able to provide any tangible lead to Asaka. If someone saw Asaka with the mirror and was sure of Asaka's identity, then that person would have testified already or the if Hotta was able to get the info then there was no chance that the persistent uploader won't be getting it. So I think nobody stated that they had seen Asaka with a hand mirror, but rather a woman with the hand mirror. If you consider this proposition, Hotta concludes that Asaka was a woman from the picture, then Hotta combines this with the fact that a woman was seen with a hand mirror and the there was a hand-mirror at the crime scene, then he with certainty can utter that Asaka was seen with a hand mirror. But He's inferring it from the data which he has gotten , he didn't get it first-hand. If Amanda's close relatives weren't sure about Asaka's identity then how could a random source was able to identify Asaka? There was no pictures of Asaka, Asaka was photophobic, clearly this is evidence enough that Asaka is very secretive and won't be roaming around so that third party sources can identify him/her. These are the evidences. All I'm saying is that the woman who held the mirror is said to be Asaka. So two conjoined events here, a woman was holding the mirror and she's said to be Asaka. Now if the second part is unreal then the whole thing gets a new dimension. I've enough evidence to believe that Asaka wasn't that woman. That's why I'm speculating that Asaka wasn't the one who was seen with the mirror. A great observation, but then we also have to assume one thing more, Vermouth vs Haibara arc was just a setup, if I'm to think of the second option which seems a bit far fetched. BO Jolly well knew about the research and Haibara also knew the purpose of the Drug. But as the Miyano files got burnt down, Haibara screwed up the development of the drug as she wrongly deciphered remains of the research papers of her parents'. So there probably were two drugs back then APTX for killing and SB for the magical cure/blah-blah. 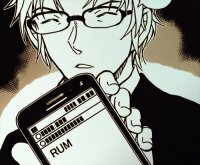 Only Rum was authorised to use APTX so Gin never knew that such a drug existed in the first place. So can we safely assume that Asaka isn't the uploader? As Asaka almost vanished in the thinn air after the incident, so she possibly wouldn't have time to cover every nook and corner of the crime scene before the police came in. Typo, so ignore that. Not exactly, then if the dying message was written in Amanda's room, then it means the duo(Amanda and Haneda) were attacked in the same room. The killer got Amanda after subduing Kohji, then drugged him too. Kohji somehow makes the dying message and gets out, because the killer has already left. Kohji dies back in his room. Rum clears the stuff in Amanda's room and leaves alone Kohji's room, I think Rum didn't even noticed the tap. Else he would have switched it off. Now if the duo were fighting off the killer and Asaka didn't come in time for help then it means Asaka was probably bribed. Rum thought of Bribing Asaka and then killing Asaka after the deed is done, to cover his own tracks. Now Rum can get the access in Amanda's room in two ways, by posing as a Bellhop/Room service or by posing as someone known to Amanda. In the first scenario, the dying message wouldn't even be there as Rum would be under the guise of a random bellhop, so the next scenario is more plausible.Now someone who is known to both Amanda and Kohji is a perfect guise for Rum to knock them off. None will be doubting him, thus we were only thinking that Rum's guise was known to only Kohji due to the tap interpretation, but now the guise gets known to both Amanda and Kohji. So Rum was probably a player in that Chess Tournament, who miraculously vanished even before the tournament/his match started. For a brief moment that also convinced me, but after the the 10 years ago, case came up(Akai family intro case) I also had debunked that theory. About the photos all I can say is that the photos weren't taken in a haste. Small details were also preserved and mentioned. Like state of Amanda's room, the tap, etc.So I think Asaka who was already suspected to be the chief accused wouldn't have had that much of a time in his/her hand. So yes I agree with you on that point, that Gosho had already given us enough to figure out the id of the uploader, and the photos won't play a major role in the timing of the events. As per my observation regarding Asaka's fingers I'm pretty sure that Asaka had a higher chance of being a man. 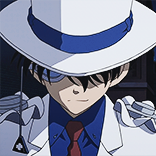 (Due to the length of the index finger, because Men tend to have longer index fingers.I saw that Gosho doesn't always hold good to 2D:4D ratios,so I'm abandoning that proposition.) Also if Hotta managed to obtain the information that there Asaka was seen with a mirror but the uploader stays silent about it. So two conclusions can be obtained from this a) Uploader knew that Hotta's information was damn wrong, but the uploader being Asaka is quite less likely proposition. b ) The Uploader is that woman who gave Haneda that mirror, who wasn't Asaka. So are you of the opinion that the mirror which was found in Kohji's room was really Mary's? But all we know is that Shukichi had an admiration for Kohji. Kohji possibly inspired him to the life of Shogi. But then would a rational woman gift her used hand mirror to the shogi hero of her son? I think it was a gift from another woman whom Hotta claims to have seen with the mirror. Or it could be a total bull, cooked up by Hotta. There was no woman with a hand mirror. Hotta invented it to make a grand show out of thin air. BTW when Hotta's performance was mentioned by Vodka Gin termed it as Rum's headache. So there might be a chance that Hotta was there at the Hotel but and saw someone with a hand mirror and now making his castle of lies based on that. I don't get what you're saying. My point is that "The Woman holding a hand-mirror, who was also seen in the same Hotel is most probably not Asaka." It's quite likely that Hotta might have seen a woman with a mirror, but was the woman really Asaka? I do have small proposition about this, though I consider it possible speculation, the only image of Asaka(or claimed image of her's) shows that her index finger is a bit longer than ring finger, so I think it's highly possible that Asaka was a man but Hotta saw someone else with a mirror. That someone(the woman) gave the mirror to Kohji. After the heated debate somehow the bottom line came out to be(For now, though I'm rather skeptical) that tap in Amanda's room was also left open. Kohji's room was ransacked. The dying message was found in Kohji's room, hidden behind broken stuff. Does this alter the meaning of the dying message?